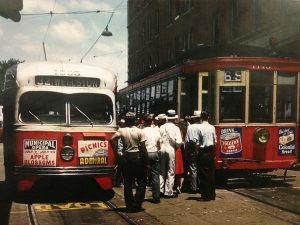 Today’s photo depicts two streetcars (or is it one streetcar and one trolley?) at the Wellston Loop in 1947. At the time, three streetcar lines converged on this loop located at Hodiamont and Dr. MLK Dr. (then Easton) – the 16 City Limits, the 32 Wellston and the 65 Woodson Road line. The tall building at right is no longer standing. Is there a difference? Technically, no. Both refer to a transit vehicle system which uses trolley poles to get power from an overhead wire. For some, trolley is an older American term that is commonly used to describe older cars, say, the car on the right. Streetcar is used to describe the mid-century models of cars. Hence, the new project in the U. City Loop uses “trolley” since it will use replicas of the older models. Interestingly, the root of the word trolley likely evolved from the phrase, “to roll,” according to the Online Etymology Dictionary. 2 things, Location was easy but I don’t see the CityLimits in the pic. I thought the photo was in the 40s, just couldn’t point out the year. Question for you, Where did the 65 street car go and what is the route called now? You got it! Actually the street car line #65, Woodson Road, went up to the 9600 block of the St. Charles Rock Road at Coles Ave. What do we call it now, it’s part of the new #35 Rock Road. At the time of the photo the 16 City Limits streetcar went thru the Wellston Loop on the Hodiamont tracks and continued all the way to Ferguson. Some cars turned at Wellston. Those would be in the back of the loop (north end) and not visible in a photo from this location.